Will MTC work with the Graphtec E6000 cutters? Or, is there hope for this in the future? This is what I bought. I haven't received it yet though. You may be able to cut to it using the File>Print option, but you will not be able to access the print and cut feature, if it has that. Please let us know when you get it, if you are able to use MTC with it. A number of people have asked about it. It is not likely that there will be a plugin made for it. You can get plugins that work from CorelDraw or Photoshop (regular versions not home or education) for this line of cutters. Thanks yall. I will let you know what I am able to do. I didn't buy Coreldraw because I can do almost anything in MTC. I will probably design there, save and import as an svg. @melissakc1 - that will work too! Can someone explain the file-print option? PLEASE!!! Go to the File menu in the software. Select Print options. Select Print wireframe Only. Click on Ok. Select Print Setup. 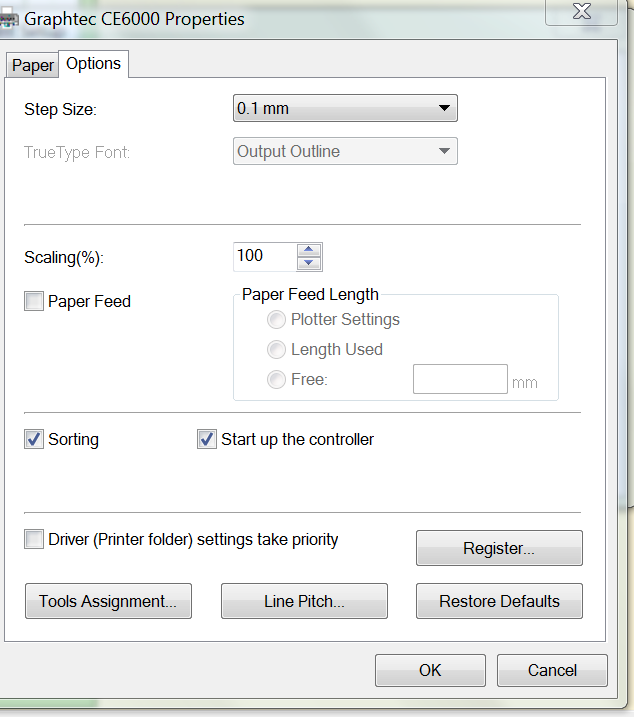 Select your Graphtec cutter as the Printer. Click on Properties. If you have the option to select Controller at the bottom of the window that opens, set up your cutting job. If you do not have access to the Controller, select Cutline settings, and click on Modify Color and select the black box in the lower left corner of the color selections, and click OK. Click on the Basic Setup Tab. 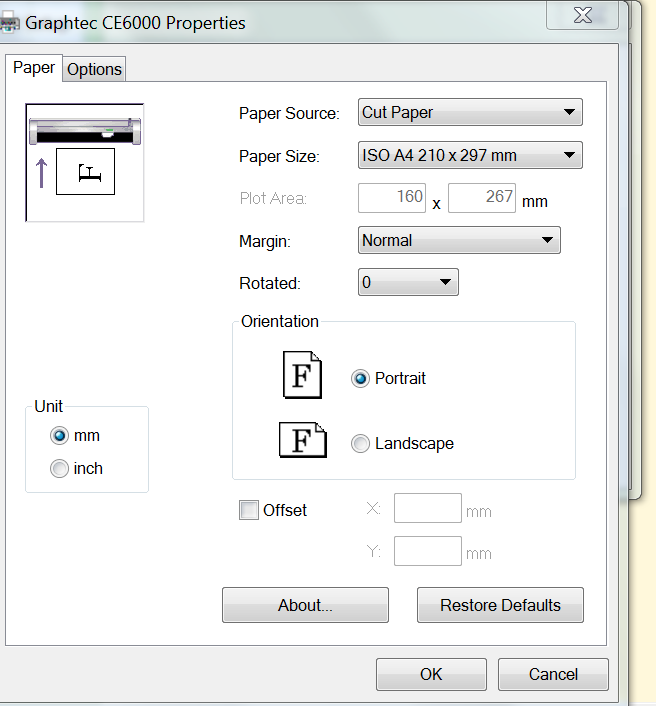 Select your paper size, orientation and uncheck Eject Medium. If you are cutting vinyl, do not check Use carrier mat. Click on OK, and OK on the next window. Make sure your cutter is plugged in, connected to your computer via USB, pressure and speed set on the cutter, and media in the machine ready to cut. Please let us know if this does or does not work for you, and whether or not you have access to the controller. That controller, if installed on your computer, should allow you the option to set your pressure and cutting speed, etc. Juliefes, this is the box I get when I click Properties. and then Options. Thanks for the images. When you have Controller selected and click on OK, are you taken to your cutter control panel? Can you access the controller to set pressure and speed? If you send to "Print" does your cutter respond? I was able to cut in the graphtec software but I can't stand it. I NEED my MTC!!! If your cutter software can import SVG files, then you next best option is to do your design creation in Make The Cut, select all, and export as SVG. Import into your cutter software for cutting. The Graphtec professional cutters are excellent machines, but they have always severely lacked in software support, so I have never been able to recommend them. So I am back at square one, but I am trying not to lose anymore sleep over it. I will get Graphtec studio down one way or another. You may need to change the step size on the machine itself to get it to cut at the correct size. Also, there is a difference between HGPL and GPGL. I believe you need to have it set on GPGL - but it has been many years since I worked with this, and I cannot remember clearly what all I had to do. However, I do remeber that by reading the user manual, and looking specifically for these two issues, that I found the answers in the manual. The changes are made on the LED screen of the cutter itself. Once set properly, you may find that it works for you. Don't give up yet! @melissakc1 may I ask why you bought the Graphtec? I mean, if you already have MTC, you know to check the list of supported cutters before buying a cutter, right? I bought a cutter that doesn't work with MTC, but I bought it before I even knew MTC existed. Once I discovered the cutter I bought would not work with MTC, I bought a Zing as quickly as I could. Gabe, I needed a big, commercial cutter with a servo motor. Make the step size larger. Servo motors are very nice, and not to be found in the home cutter market. That is why I liked the Graphtec pro cutters. But not having excellent software to drive them made me decide to look elsewhere.